Bumble tells us that only once since the second world war have England won the first Test of an Ashes series. Massive call by Australia to debut Ashton. Strauss says that Smith's spin bowling is "work in progress". Which isn't exactly a glowing endorsement. England have picked Finn over Bresnan because of the extra pace and bounce. Grab yourself a cold drink and a cucumber sandwich and settle in. I'll be back with you for the first ball in 20 minutes. #Ashes fact: Aussie debutant Ashton Agar, 19, was born after Ian Botham had retired from first class cricket. Lesley Garrett has blasted out the National Anthems. And we've had fireworks. Yes fireworks already. Cook has his serious game face on. The anticipation has reached FEVER PITCH. With the overhead cloud, it might be a testing first hour - the obviously "crucial" first hour. Huge cheer for Cook and Root as they bound out to the middle with the rousing sound of Jerusalem in the stadium. James Pattinson takes the new ball and starts with a wide - not quite a Harmison but nearly. His second ball is a filthy leg-side one. Round arm swing from the hand from Pattinson but he doesn't find his target until the 5th ball. Nothing alarming at all for England from that over. 2 extras from it. Rubbish 1st over from Pattinson. He'll take 40 wickets this series. Left armer Mitchell Starc takes the new cherry from the other end. The first runs off the bat come off the bat of Captain Cook. Ball on the pads and is clipped in Cook style in to the leg side for the first boundary of the series. Anything on Cook's pads will be clipped like that. If I were them I wouldn't bowl there to him. National Anthems, Jerusalem, Red Arrows, Cricket, Trent Bridge... Crikey..
KP pushes a single behind square from then first ball. Trott looking assured as he drives another decent ball to the boundary just wide of the man at cover. Then a quick single which is good stuff from England rotating the strike, being busy. Clarke responds by putting another catcher in for KP who plays down the 5th ball of the over. The final ball is clipped behind square on the leg side for a single. Left armer Starc to Pietersen who appears desperate to get off strike. He comes right forward and defends the first two balls solidly. There's a packed legside field but KP pierces it with the 3rd ball all the way to the boundary. A beautifully timed drive. KP negotiates the Starc battle and that takes us to Lunch. A fascinating session. England lost both openers but Trott is looking assured. A lot there for the bowlers who've found a nice bit of both conventional and reverse swing. Time for a smoked salmon sandwich and a cold drink. Be back at 1.40 for the afternoon session. Every England fan is feeling the weight of expectation, and I anticipate a whitewash in the series. However the only ones without any nerves are the players. They have just handled the game with an assurance and a confidence that only players of their class can have. I suspect when Cook won the toss and decided to bat he hadn't banked on his established batsmen (including himself) playing as many loose shots. In three first days of the ashes, Siddle has 12 wickets. With Gift Aid, Matt Prior's wicket is worth 25% more to Australia. Now is the time to see if Captain Cook is the man to win the Ashes for the nation. He must steady the players, but Cook's job is harder with Prior having just given up his wicket. We wll win, but not as easilly as we all predicted in the run up. England very poor batting... !!! The bowlers are going to have to pull the batsmen out of fire again! Swann is caught and England are 215 all out in the 59th over. A tame end to a tame English innings. Bowled out in 59 overs. 5 wickets for Siddle, 3 for Pattinson and 2 for Starc. Pretty poor innings and probably about 85 short of a decent total, saying that I don't expect the Aussies to set world on fire either with our bowling attack, if we can get a lead however small it will give us a psychological advantage. No worries Finny. Take it out on the Aussies with the ball. Even I got a 1st baller on Saturday, it happens to the best of us!! Anderson has got the ball hooping a bit but a bit loose from him. Broad is off the field presumably because he is in pain after being hit on the shoulder. Anderson is having to continue - Hughes flicks the 3rd ball for a single. The 5th ball is a decent length but pushed by Smith for a single and then the final balls is worked into the off side for 2 runs. It comes to something when Australia are relying on Steve Smith for runs. Swann getting a lot of revs per minute. Smith chips up the 4th ball but it is just wide of Cook at short cover and they pick up a single. Men all round the bat for Hughes who plays the 5th ball down into the offside. He then whips the final ball off the outside edge into the legside but it is well fielded by sub Ben Foakes. Paying public likely to lose out on eight overs here. The over rate today has been terrible. Yes there's been a lot of wickets but it's still awful. Smith gets a single from the second ball of the over, rocks back and finds a gap in the offside field. Smith pushes another one into the off side 5th ball and scrambles a single. There's a bit of a theme developing but he's moved on to 33 and has gone better than any of his teammates. A low full toss from Swann is driven sweetly to the cover boundary by Steve Smith. Next ball is driven straight back to Swann. The partnership moves to 20. 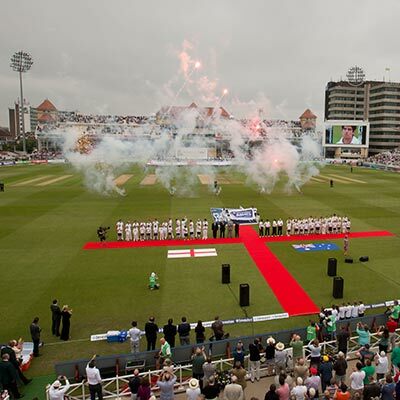 Few saying today similar to first day of Lord's 05. Think the overall quality was a whole lot higher that day though. Smith clips Anderson offside for a single from the 3rd ball. then Hughes follows with another clip for a single from the 4th ball. These two have ticked things along. It's not beautiful but it's working. Hughes pads up to the final ball - they appeal but it's given not out.